Don't worry. This review is spoiler free. Solo is the second Star Wars anthology film, the first being Rogue One: A Star Wars Story in 2016. 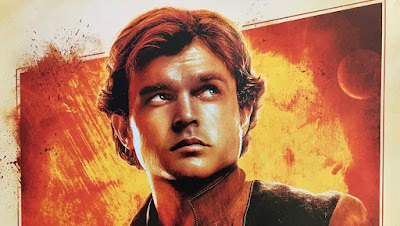 Solo obviously focuses on a young Han Solo and he just begins to make a name for himself in the criminal underworld. The decision to make the film was expectedly met with some criticism as it led to some recastings of both Han Solo and Lando Calrissian. Then, much like Rogue One before it Solo experienced some massive behind the scenes issues resulting in original directors Phil Lord and Chris Miller getting fired and replaced by Ron Howard, who then is believed to have reshot 80% or more of the movie. Solo takes place in the period between Revenge of the Sith and A New Hope. The Empire is in full control of the galaxy and while they aren't the main villains of this film they loom over everything. The film chronicles Han Solo's dive into the criminal underworld as a young man. How he met Chewbacca, how he gained control of the Millennium Falcon and how he becomes the scoundrel and smuggler that we know when we meet him in the cantina in the first Star Wars. As many reviewers have said. Solo is a great palette cleanser. I really enjoyed The Last Jedi a lot, but you can't help but mention the heavy themes and moments. You can go into Solo knowing that Han, Chewie and Lando are all going to make it out alive. I think that Solo is a really fun time, but its still probably my least favorite movie of the Disney 4. I think the best place to start with this movie is Alden Ehrenreich's performance as Han Solo. As far as I'm concerned the marketing for the movie was so solid that by the time this movie started I had already accepted Alden as Han. I think that he's really the star of the movie. He's got Han Solo's charm, his wit and the swagger. He may not be Harrison Ford, but that never really crossed my mind through the whole film. This is Han's movie and most of the other characters in the movie are shaping Han into the person we know from classic Star Wars. The whole cast is really good. The other standout for me was Woody Harrelson as Han's mentor Beckett. Lawrence and Jon Kasdan, the film's writers, said that Beckett is the character that influences Han the most and I would believe that after seeing the movie. Beckett has a real soft spot for Han and gives him a lot of advice about being a criminal. "Assume everyone will betray you and you'll never be disappointed". A lot of people seem to have mixed feelings on Emilia Clarke outside of Game of Thrones. I thought she was excellent as Han's love interest Qi'ra. The pair have a bit of a history as they've been friends since they've been young (I'm bound to learn more in the new book Most Wanted) and you can tell that they both care deeply from one another. Although Qi'ra is not nearly naïve as Han, they've really had to struggle to gain every inch they've acquired in life. I wouldn't say that I was disappointed by Donald Glover's performance as Lando Calrissian. I thought he was quite good, but what did disappoint me was little he was involved in the story. Lando basically only exists in this film for Han to win the Falcon from him (which we obviously know will happen). I was expecting the script to find more for Lando to do especially when casting Glover in the role was so well received by everyone. I was expecting more of a "bromance" between Han and Lando, but they were more rivals than anything. I hope that it won't be the last time we see the Childish Landino. Lando's droid co-pilot, L3-37 also got mixed reception from me. If fans were worried about comparisons to K2-S0 they shouldn't be, but I didn't like L3 nearly as much. I just didn't really care about the whole "droid lives matter" element of her character. One of the other events that everyone knew was going to go down in this film was the first time Han and Chewbacca meet. One thing that I was happy to see that all these big events were things we knew were coming, but they were still given to us in a really unexpected way. The story takes some unexpected turns by the time all is said and done. I don't know if I got all the Han and Chewie moments I expected, but there is definitely more Chewie content than any other Star Wars film. I thought the action sequences were fairly tense and for some reason I felt like there were some stakes even if Han isn't going to die in the movie. Both the Kessel Run and the cool train heist live up to the hype. Although there isn't exactly much spectacle in the last few minutes. The ending is one of my issues. I felt like a lot happened really quick. With a standalone movie that is on a much smaller scale than any of the Star Wars movies we've gotten at this point I guess I couldn't really expect a big battle to close out the movie. I'm pleased to say that Solo has more tie in than any other Star Wars films in regards to media outside of the movies. I won't reveal any of these cool moments, but there are some great tie ins back into Star Wars cannon and I appreciate Ron Howard and Kasdan's going the extra mile to reward those of us who have tried our best to follow Star Wars books and comics. I was really disappointed to see that this movie underperformed at the box office, because I really feel like it deserves better. Its still stronger than the prequels and if they did decide to dig deeper into Han Solo's early adventures I would be more than happy to check it out too. I would hope that Ron Howard gets a chance to make another one of these and get to start the movie from scratch this time. 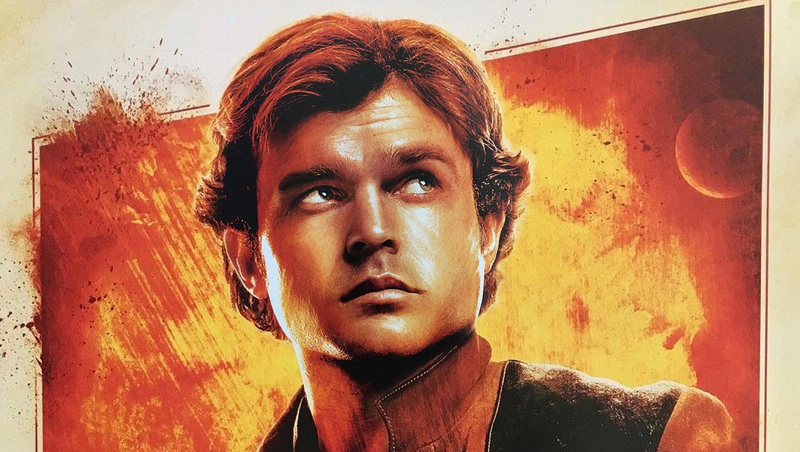 Solo: A Star Wars Story gets 80 out of 100.